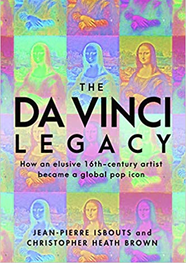 Jean-Pierre Isbouts, a doctoral professor at Fielding Graduate University, and Christopher Brown, a North Carolina art connoisseur, are the authors of the book The Da Vinci Legacy (Apollo Publishers), due out on April 30, 2019. One of the great riddles of modern times is why a 500-year portrait of a Florentine housewife, of no rank or title, is today the most famous painting in the world. But the mystery around that portrait has now deepened. New findings suggest that Leonardo da Vinci’s most celebrated work may not depict M(ad)onna Lisa, wife of the silk merchant Francesco del Giocondo, at all. For example, art experts have long believed that the painting dates from Leonardo’s late period, given its heavy sfumato or dark, “smoky” treatment. But a handwritten note, discovered in the library of the University of Heidelberg, has revealed that Leonardo painted the work as early as 1503, at least a decade before Leonardo’s late period. What’s more, a 16th century biographer, Giorgio Vasari, claims that Leonardo worked on it for only four years and then left it unfinished. That’s a bigger problem, because if anything, the Mona Lisa in the Louvre is as polished as any Leonardo work would ever get. And to top it off, Leonardo himself once told a visitor in 1517 that the portrait was made for Giuliano de’ Medici, brother of Pope Leo X, under whose patronage Leonardo lived in Rome between 1513 and 1516. Why is this important? The simple answer is: we believe these sources don’t agree because they are not talking about the same painting. In other words, there must be two versions of the Mona Lisa, both painted by da Vinci. Would this be a radical theory? Not at all. We know, for example, that Leonardo painted two versions of The Virgin of the Rocks, now in the Louvre and the National Gallery in London, just as he painted two versions of The Virgin of the Yarnwinder, now in private collections. In many of these works, Leonardo allowed collaborators to “fill in” the less important parts, such as the background and the clothing, while he concentrated on the critical stuff: the faces and hands. This process served two purposes: it allowed Leonardo’s assistants to learn the master’s technique, and it increased the number of works that could be sold. Leonardo worked very slowly and only produced 18 paintings that we know of, which is a problem when you have a large workshop and many mouths to feed. But if Leonardo painted two Mona Lisa’s, where is the other one? 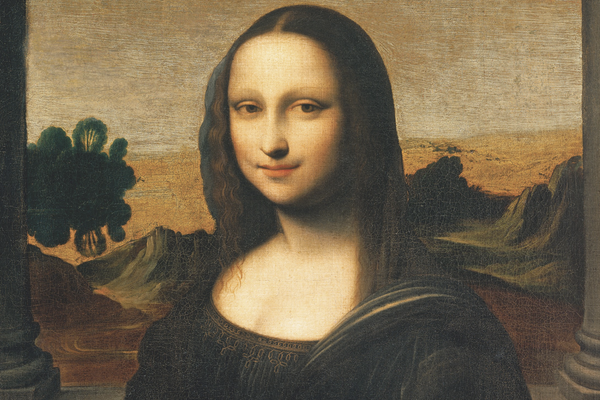 Diligent research into a number of possible candidates, notably by Salvatore Lorusso and Andrea Natali at the University of Bologna, has produced a winner: a portrait known as the Isleworth Mona Lisa, long believed to be a copy. Close inspection reveals that unlike all other 16th century versions of the Mona Lisa, the Isleworth is not a copy at all. In key respects, including its size, its composition, its landscape, and its support (it was painted on canvas, rather than wood), it is strikingly different from the Louvre Mona Lisa. What’s more, it depicts Lisa del Giocondo as a beautiful young woman. That makes sense, because in 1503 Lisa was just 24 years old, quite unlike the matronly figure who stares at us from behind her bulletproof glass at the Louvre. And here is the clincher: the Isleworth is unfinished, just as Vasari wrote. Most of the background never progressed beyond the gesso, the underpaint. So why has no one else looked more closely at the Isleworth version? As we argue in our book, the answer is that for much of the past 500 years, she was not on public view. First acquired by an 18th century English nobleman, the work was discovered in 1913 by a British art dealer, Hugh Blaker, during a visit to a stately home in Somerset. The Isleworth then spent much of the 20th century in vaults, in part to protect her from two world wars. In the 1960’s, she was purchased by a collector, Henry Pulitzer, who soon thereafter locked her up in another vault, where she was discovered in 2012. And now that’s going to change, because there are plans to put her on exhibit in the land of her birth, later this year—as part of the commemoration of the 500th anniversary of Leonardo’s death in 1519. That’s when all the world will be able to see her in all her glory—as the true likeness of a lovely young mother who would remain on Leonardo’s mind for the rest for his life. That brings us to the final question: if the Isleworth Mona Lisa is indeed the earlier version, then who is the older woman in the Louvre? Is she a later version of Lisa del Giocondo, painted in middle age? But why would Giuliano de’ Medici, a powerful aristocrat who took several mistresses, want a likeness of the wife of a silk merchant? Could the Louvre Mona Lisa depict one of his paramours instead? A number of candidates come to mind, but the solution that seems obvious to us is also the simplest: the Louvre Mona Lisa is no longer the likeness of a particular person. While Leonardo used the same “cartoon,” the preparatory drawing, from the earlier version, he was no longer interested in painting an actual portrait. Instead, he wanted to create an idealized image of motherhood and the mysterious forces of creation, as evidenced by the primordial landscape in the background. Remember, Leonardo was taken away from his mother, Caterina, when he was only five years old. That’s why Leonardo was so struck by Lisa, because in 1503 she was close in age to his last memory of his mother. And that’s why, for the Louvre painting, Leonardo chose Lisa again—not to paint her likeness, but to capture the eternal grace and mystery of womanhood. Don't miss the TV special based on the author's research: The Search for the Mona Lisa, narrated by Morgan Freeman and produced by Pantheon Studios. Timed to coincide with the 500th anniversary of Leonardo’s death on May 2, 2019, the film shows that the portrait has become the center of a swirling controversy. If she is not the Mona Lisa, then who is she? Why did Leonardo da Vinci paint her? Using newly discovered evidence, and featuring Italian star Alexandro Demcenko as Leonardo, the film is a thriller-like pursuit for the real identity of the most famous portrait in the world.